Ottawa Senators goaltender Craig Anderson has left the team to be with his wife Nicholle, who was recently diagnosed with cancer. The Senators say there is no timetable for Anderson's return. Ottawa Senators goaltender Craig Anderson has left the team to be with his wife Nicholle, who was recently diagnosed with cancer. UPDATE: Craig Anderson has left the team to be with his wife Nicholle and will not play tonight. Unsure when he will return to the team. Anderson took a leave of absence last week, returning on Sunday to make 37 saves in an emotional 2-0 shutout win over the Edmonton Oilers and on Monday was named the NHL's first star of the week. Anderson's initial return to the team came just one day after general manager Pierre Dorion announced Nicholle Anderson's cancer diagnoses. 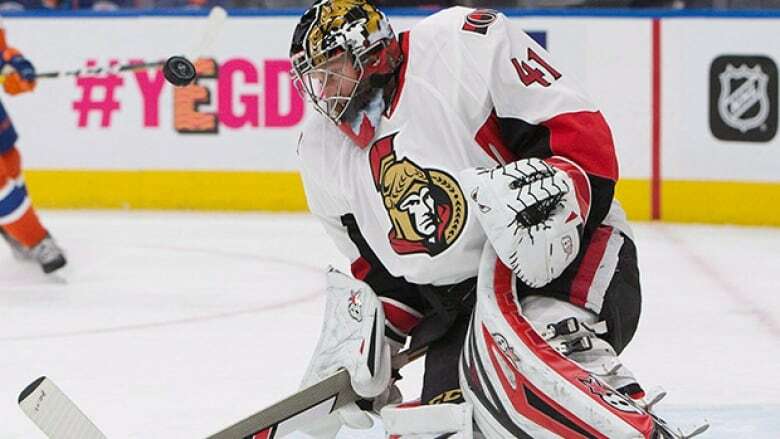 Anderson went on personal leave last Thursday, but on Nicholle's encouragement returned just days later after fellow goalie Andrew Hammond was injured. Goaltender Mike Condon, recently acquired from Pittsburgh, is scheduled to make his first start of the season when the Senators host Vancouver on Thursday. "If we look at our situation now, we don't know when [Anderson] will be back," said Senators coach Guy Boucher, as per the Ottawa Citizen. "The reality is nobody knows [how long he's gone]. He's with his wife and they're taking care of tests and other things," Boucher said. "Anything is possible right now. We have no clue. That's what is difficult. It's difficult for him and it's difficult for us. That's why Condon is here. "We're going to go one day at a time with this one for sure."